LOCATION.--Lat 40`31'31", long 75`52'31", Berks County, Hydrologic Unit, 02040203, on right bank, downstream side of State Route 143 bridge, at Virginville, PA.
DRAINAGE AREA.--157 square miles, includes that of Sacony Creek. GAGE.--Water-stage recorder and crest-stage gage. 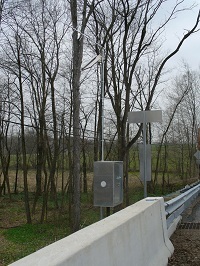 Datum of gage is 440 ft above National Geodetic Vertical Datum of 1929, from topographic map. Satellite telemetry at station. COOPERATION.--Station established and maintained by the U.S. Geological Survey. Funding for the operation of this station is provided by the Delaware River Basin Commission. Supplied by USGS.-- Data transmitter operational limit - 23.7 ft.